Possible/Probable? Early History - as of 03/03/2009. 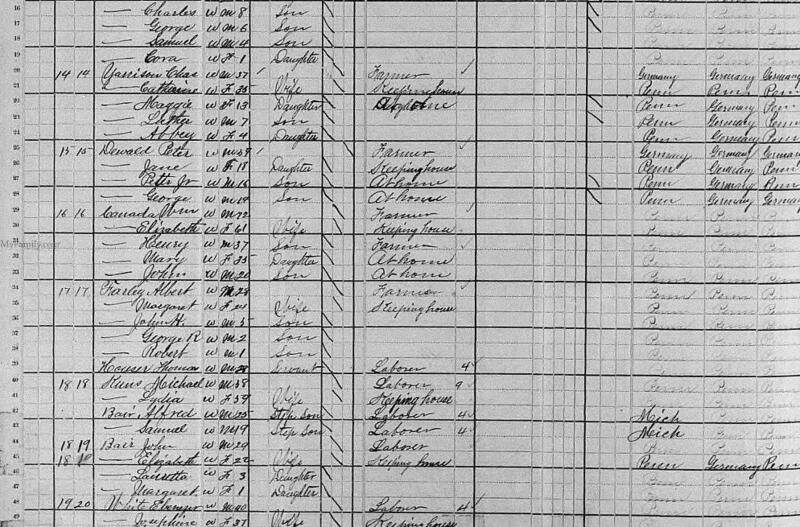 From US Federal Census data for 1860 - 1920, it appears that Frederick and William(Wilhelm) Yarison, brothers I believe1, immigrated to the USA from Prussia/Germany. I believe William(Wilhelm) Yarison is my great great grandfather. I have not been able to find them in immigration records. Frederick arrived first, in 1852, along with his wife, Mary (also from Prussia), and Charles F. Yarison, the oldest of their three young sons. See 1892 article (which only mentions Charles F. Yarrison). 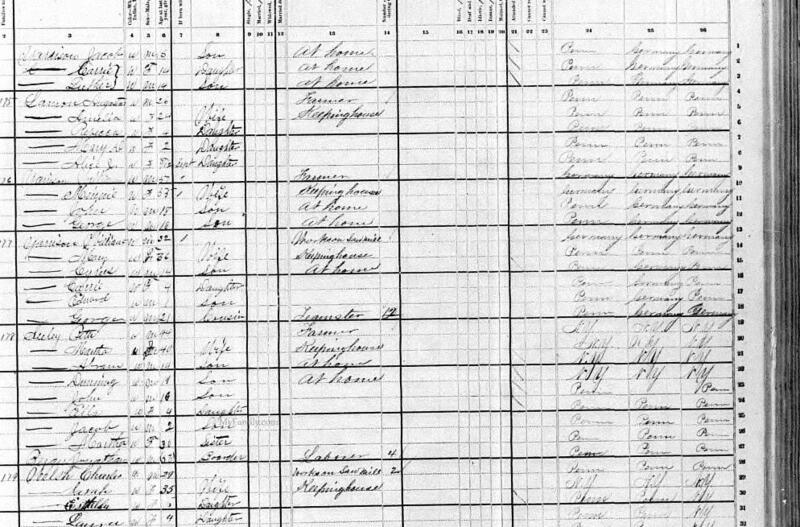 Frederick's other two sons: Frederick C. and William C. J. Yarison, and his daughter Henrietta F, are believed to have remained behind in Prussia with relatives - migrating with them later, in 1856 - as recorded in 1920 Census. Frederick's brother,William(Wilhelm), arrived in 18562 along with his wife, Melia/Meriah/Minnie (also from Prussia), and their son, William - who I believed is William G. Yarison4 (my great grandfather). I believed they also brought along Frederick's two younger sons: Frederick C. and William C. J. Yarison; and daughter, Henrietta Frederica. In 1860, finally united, the families of these two brothers(?) lived in the Elimsport, PA area (Washington Twp., Lycoming Co.). Thanks to information provided by researcher, Mary Carr, on 7 Jul 2004, who found them recorded in the 1860 Census as "ERGSON". Her data indicates that there may also be a sister of Frederick and William (Wilhelm), too. In 1870 Frederick and William(Wilhelm) Yarison and their growing families (including two sets of twins!) were living in the Elimsport, PA (Washington Twp., Lycoming Co.) areaA , except for Frederick's three oldest sons: Charles F., 27/(29), Frederick C., 23 and William C. J. Yarison, 20. They had migrated to the Sugar ValleyB near Loganville (now Loganton) in Greene Twp., Clinton Co., PA. 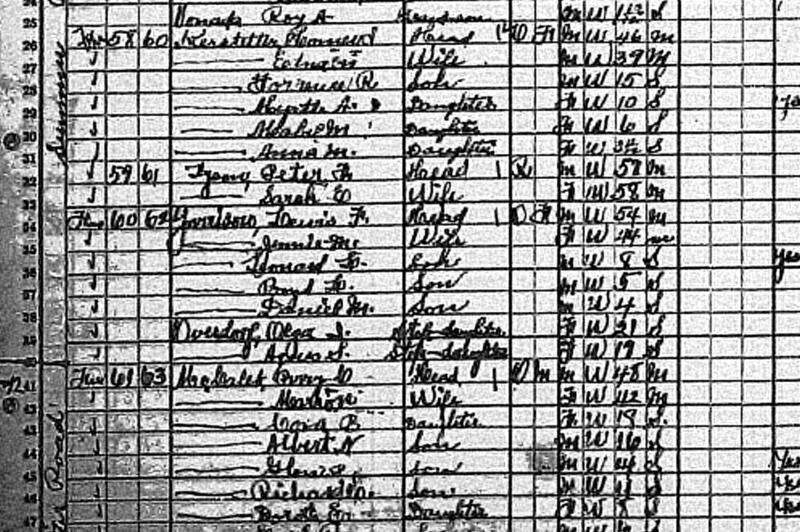 There, Charles F. and his wife Casha?/Catharine, 26, from PA, had a daughter, Margret, 4 and Charles F.'s occupation was recorded as "Ingineer". But I think all three were in the logging/sawmill trade. Back in Elimsport, William G. was 23 and not yet married. By 1880, Charles F.C had moved back to Elimsport, where Frederick D E , William(Wilhelm?) and William G.C still lived. There, William G. was now married to Mary M. Showers (my greatgrandmother) and started a family. Frederick C. had died in 1873. William C. J. was married to Priscilla Grapes and had moved from Sugar Valley to Monroe Twp. in Juniata Co, PAF . By 1890, although can't find much on any of the family, I know that William G. and Mary had moved to Sugar Valley in Clinton Co. and lived in Crawford Twp (north of Loganton). Their last child, born in 1886, was Simon Wilbur Yarrison (my grandfather). In 1900, old Frederick(82) and wife Mary? 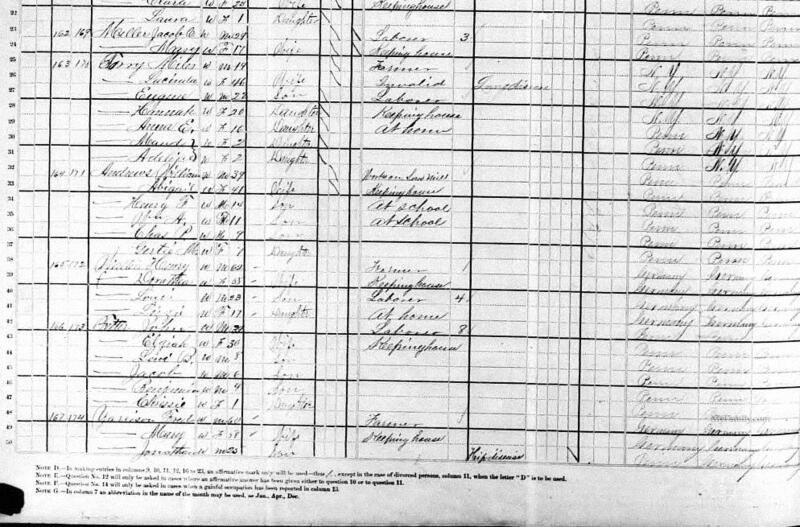 (78) were living with their daughter, Catharine and son-in-law, William Greenawalt, in Loyalsock Twp, Lycoming Co, PA. Thanks to Belinda Keal for finding this for me, and suggsting they may be buried in Wildwood Cem). His brother, William(Wilhelm) Yarison is believed to be deceased, but I do not know where either of these brothers are buried. I cannot find Charles F., but he was still living - probably in Elimsport (because that's where he is buried with his wife Catharine). William G. and Mary Showers still lived in Sugar Valley in Crawford Twp. Clinton Co. and he was in the Sawmill business. William C. J. and Priscilla Grapes now lived in the Linden, Woodward Twp, Lycoming Co, PA area. In Abt 1905, Simon Yarrison married Grace Viola Smith(my grandparents)... and had a daughter: Genevieve Gladys, (my mother). NOTE: that this research has been hampered by variations in the spelling of the family Surname. I believe the original version was Yarison, and that it evolved slowly over time to Yarrison. Early documents have the name spelled both ways, and, e.g., my great grandfather's grave marker says, "William G. Yarison". 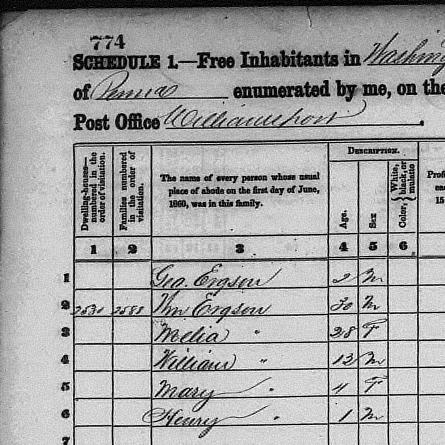 To further complicate this issue, both the families of Frederick and William(Wilhelm) Yarison are recorded in the 1860 US Census as "Ergson"! So who knows what the original German (Swedish?) spelling was!? Yarrison/Yarison Data Most of this data was supplied by my mother. Believed to have immigrated to USA in 1856 w/ wife, son William G. and nephews Frederick C. & William C./J. c.  Harry W. Yarison (Sep 1880 - 1961) Limestone Cem. m.  Jennie V. Kurtz (1881 - 1944) Limestone Cem. Clinton Co, PA - J.C. NY/Limestone Cem. c.  Harold Melvin Yarrison  (Sep 3, 1905 - Jan 15, 1958) Limestone Cem. Sgt. Company A, 99 Cml Mortar Battalion. Served in North Africa and Italy during WWII. See Fred & Anna Data for Source of data for Renee & Lee Rockey. Immigrated to USA in 1852 w/ wife and two oldest sons (not sure about Frederica). Yougest son is believed to have come with his brother William's family in 1856. Was major league baseball pitcher - 1922 w/Phila. Athletics AL & 1924 w/Brooklyn Robins NL. 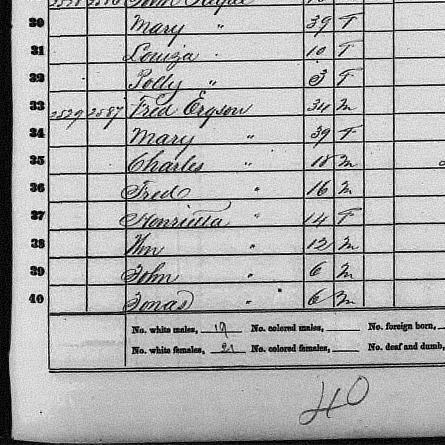 Note: 1880 Census says Robert's mother was Annie, but ages match! but the there is a Robert F. Yarrison, too, that I can't place! Is believed to have come with his uncle William Yarison and his family. 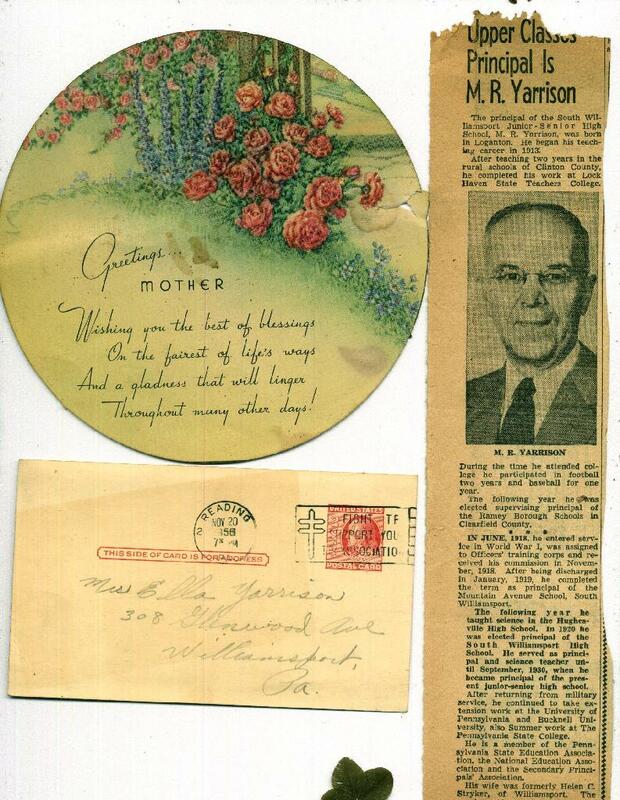 c.  Robert P. Yarrison  (Abt 1887 in PA -  )  Lived in Wmspt. c.  John Yarrison  (ABT 1855  -  BEF 1893) Jonathan's twin. c.  Jonathan Yarison  (ABT 1855  -  BEF 1893) John's twin. Had some affliction mentioned in census. See 1880 Census data 15/16 yrs old???? 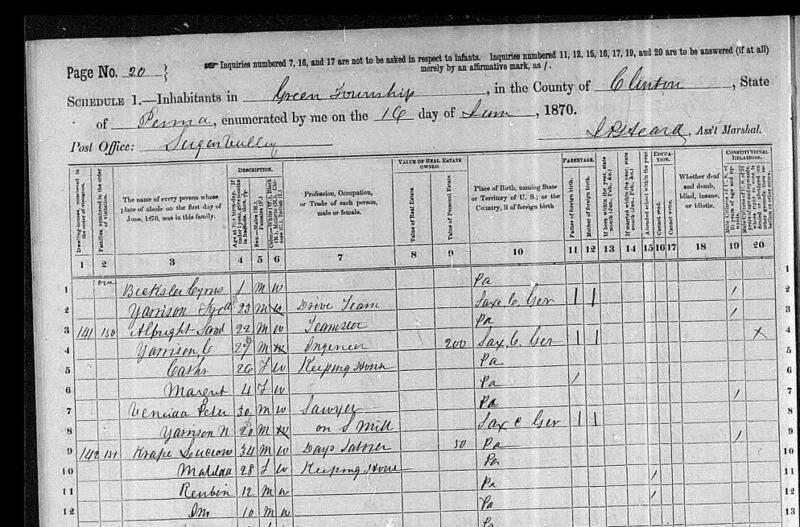 Married: 28 Dec 1883 in Clinton Co, PA.
See Fred & Anna Data for Source of data for Lewis F. & Mary Anna. note: says only 5 of 6 children living in 1910 - 6th ? YARRISONS Gravesites - found May 3 & 4, 2002 on trip to Penn State. ---- where did this data (below) come from ? c.  Ella (Mary E. Mowery)? Yarrison  302 Glenwood Ave, Williamsport, PA MR Yarrison Obit. 35  Charles              18    Laborer         "
38  Wm. [C.J.] 12                    "
39  John                  6                    " ? 40  Jonas                 6                    " ? 4   William  (G?) 12                    "
8   Mary                 47? Housewife    Prussia         "            "
9   John                 15\                  PA            "            "
10  Jonathan             15/                  PA            "            "
11  George (F.)? 11                   PA            "            "
12  Catharine             9                   PA            "            "
? (    Jacob               5/6/7? PA            "            " ) not listed ?? 13  Caroline (Carrie)? 6\? PA            "            "
14  Louis  (Lewis F)? *   6/? PA            "            "
Meriah? 45? Housewife    Prussia         "            "
William (G.)? 23    Farm Laborer Prussia         "            "
Mary                 16                   PA?           " "
Henry                 8 [11 at least]     PA            "            "
John    (L.)? 6                   PA            "            "
George                4                   PA            "            "
34  Sarah                50    Housewife      PA            "            "
35  Emma   (Note *)      16                   PA            "            "
36  Harriet               9                   PA            "            "
** (Abbie Theresa)? (b: 8 JUN 1878) from gravesite. Doesn't match census age! 19/1   Jacob               15/16?                 " "            "
2   Carrie (Caroline)? *  14\                  "             "            "
3   Luther (Lewis)? 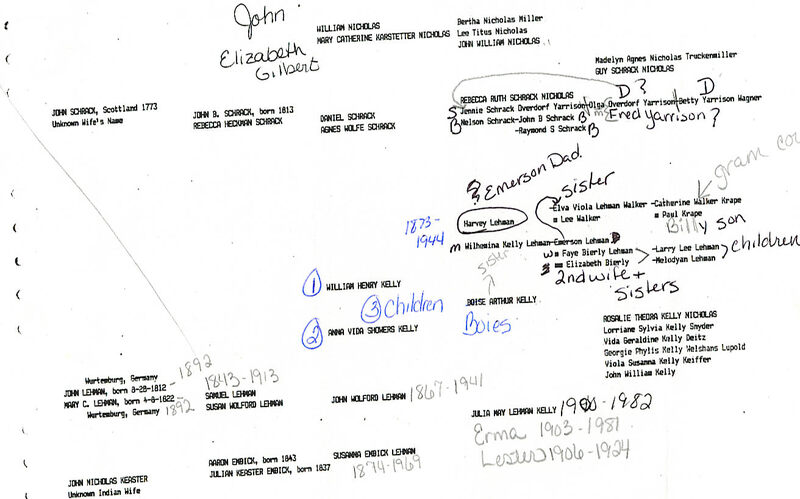 *  14/                  "             "            "
* still twins, but Names & Ages don't match 1870 data!??? died in 1873 - which was about the same time that Robert F. was born. 14/27  William (C?) YERASEN  30    Farmer      Ger Stult? Ger      Ger Stultz? 99   Frederick  Yarrison     87  9/1818  father-law   55    Ger     Ger     Ger    1858? 100   Mary          "         78  3/1822  13c/8living  55    Ger     Ger     Ger    1858? ............... 4   Dean ROCKEY, Jr. I am Guy Nicholas' granddaughter. I am working on the family tree from our end. mother as being Anna Vida Showers. Where did the Wentzel name come from? Julia was my great-grandmother. Her oldest daughter Rosalie was my grandmother. Rebecca Ruth Schrack had a sister Jennie Schrack. John and Rebecca (Heckman) Schack had 4 children. There son John R.
had a daughter Nettie who married a Yarrison. It does not say who. Yarrison first and had 2 sons: Merle and Boyd. Then it lists Overdorf. m2. Lewis F. YARRISON  ( 1864  - 1949  ) after his 1st wife died in 1910. .... 1930 Census lists Nelson as Fred's nephew!!!! c.  They had 13 kids! 4. 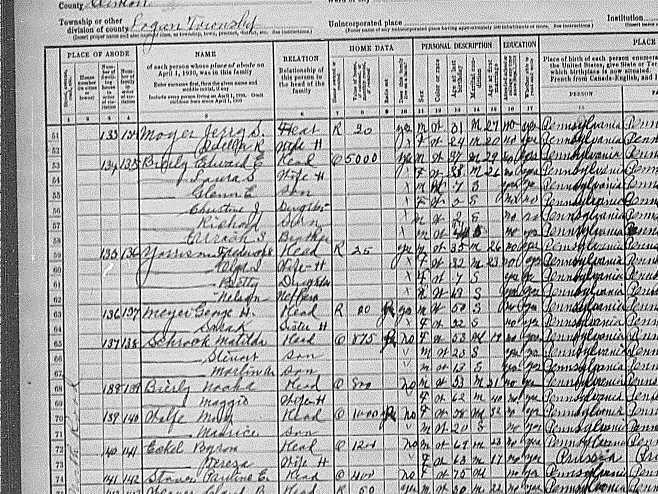 - in 1880 Census, George F. Yarison (Frederick's son), is living with William G. Yarison (William(Wilhelm? )'s son),and is listed as William G.'s cousin! 5. - is this enough? 4. - No data for Frederick (old), William(/Wilhelm?) or Frederick C. because they died before 1920 Census. Try to verify immigration date & place. Visit SUNY Bing. Library to view 1852-1856 Immigration Records. Also, try to trace their whereabouts between 1852/3 and 1860. So far, attempts to find them in Immigrant Ships Passenger Lists have failed. Proof? that Charles F., Frederick C. and W (William C. J.) Yarrison are brothers. 4. - there are some special markings and tickmarks by their names? Need proof that young William is actually William G. Yarison (my great grandfather). Except for his tombstone, I have not seen the G. initial in any published source. 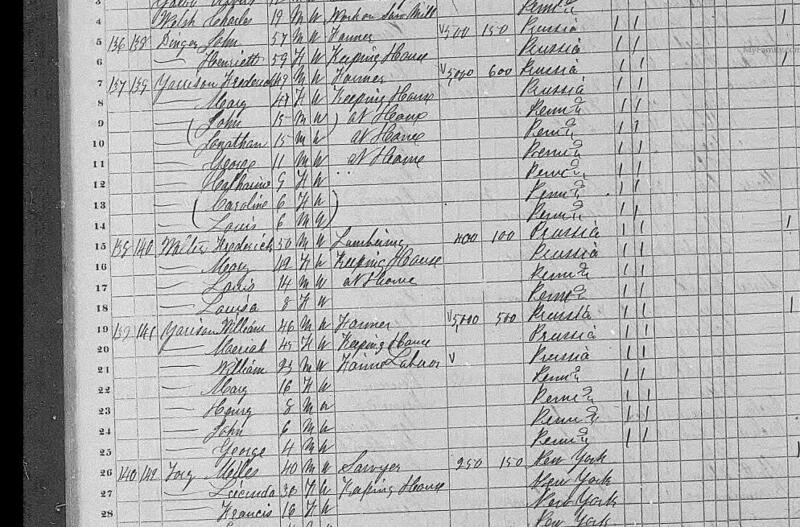 Re: Continue 1860 Census search for YARRISONs in other PA counties. 7-24-2004, received information from researcher Mary L. Carr to look in 1860 Census for "Ergson"... and found the Yarrison families [Frederick (old), William(Wilhelm)] in Elimsport area, as expected!!! Thank you Mary! Appearently the family name was changed from either Erghson/Ergson to Yarison/Yarrison somehow?/sometime? after they settled in Pennsylvania. Mary's info furthur indicated that old William's native name may have been "Wilhelm". This may help in researching immigration data!? The trouble I had finding him was because he moved him family from Loganton to Juniata in abt 1872. Stanley's data pretty-much matched my 'bits-and-pieces". 11-11-2006, from the data, it's always looked like William C. and Willims J. were the same person. This is what led me to list him as William C/J. in the references above. But finally I've found a reference to William C. Jonathan Yarrison which make believe he had two middle names... and this solves the problem of C. or J. 7-15-2004, Robert Russell Schadt [rschadt@kcnet.org], who has listed all the Cemeteries located in Clinton Co, PA, told me of a forthcoming book which will be a complete listing for every one of the Clinton county cemeteries. WOW! ... due out in October 04, maybe sooner.